Following up their Greasy Lake, Thunder Road, and Rosalita "Little Cafe" shirts, here's another one courtesy of our friends at Protect, the National Association to Protect Children. Their line of T-shirts from fictional locales benefits the work that they do, and like their previous Boss tees, they're letting us make this one available to our readers through Backstreet Records. 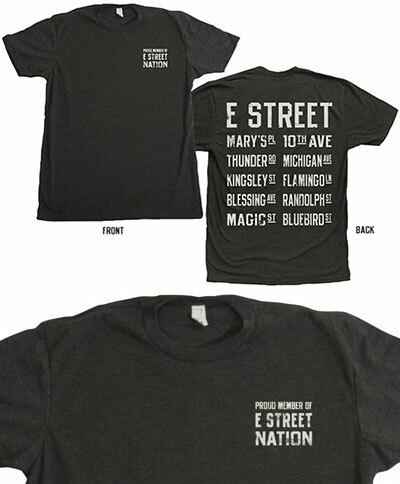 This soft, two-sided tee reads "Proud Member of E Street Nation" on the front chest, and on the back lists a number of the Nation's important highways and byways -- including, of course, Thunder Road, Tenth Avenue, and Flamingo Lane -- all in distressed, light gray type on a charcoal shirt. Screen-printed in the USA, on 100% cotton Royal Apparel USA-made shirts. Proceeds go to benefit Protect.org.